“Narrow Range” = “NR” (aka “Limited Range”, “Low RGB”, “TV“, “Broadcast”, etc.). In 8 bit representation the boundaries of this range are [16, 235] , in 10 bit they are [64, 940], in 12 bit [256, 3760] and so on. The headroom above 235 and the footroom below 16 accommodate signal overshoots (“ringing”) due to filtering and specular highlights. The U & V signals are just scaled versions of Color Difference signals B-Y and R-Y, so they are bi-polar by definition. To fit the available [0, 255] range UV signals are centered (after scaling) at mid-range point 128. Thus, for UV signals Reference White Level = Reference Black Level = 128 (512 on 10 bit scale). In broadcast environment levels from 1 to 254 are available for video, levels 0 and 255 are used exclusively for SDI interface synchronization. The [0, 255] range referred to as “Full Range” = “FR” (aka “High RGB”, “PC“, “CG”, etc) is also widely used for digital RGB interfaces, e.g. HDMI. For YUV signals the Narrow Range ( [16, 235 Y], [16, 240 UV]) is mandatory; some consumer product use non-standard ”yuvj” [0, 255] color space. In file based environment all levels from 0 to 255 are available for video (NR and FR) – because there is no need to reserve levels 0 and 255 for synchronization purposes. For UV: Black = White = 0, Min Limit = -0.5, Max Limit = +0.5. HD means BT.709 and SD means BT.601 standard. All matrices are balanced, i.e. the sums of their coefficients = 1, so the R = G = B = 1 (100% white) input produces Y = 1 (max Y value) output. For practical applications the RGB to Y gain factors should be rounded to the appropriate bit depth, and it is very important to keep Unity Gain principle (sum of 3 coefficient must be exactly 1). The following RGB ⇔ YUV matrices are just math derivatives of the 3 fundamental column matrices as above. 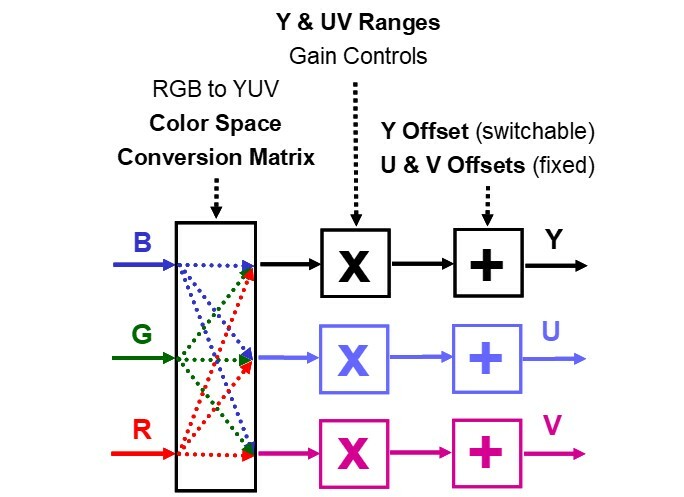 Note the U & V gain factors = 0.5 for the corresponding B & R inputs and UV White Balance (if R=G=B=1, then U=V=0). This is due to the requested mapping scheme: UV output range is [-0.5, +0.5] centered at 0.0 point. MathCAD calculated UV coefficients with high accuracy (up to 5 digits after decimal dot). For practical applications they should be rounded to the appropriate bit depth, and it is very important to keep UV White Balance (sum of 3 coefficients in UV rows must be exactly zero). Note the Y to RGB Unity Gain factor – all 1st column coefficients in all 3 matrices are exactly 1. Also note the U to R and V to B gain factors are 0. In other words, it means that the UV axes of YUV color pace are orthogonal and there are no cross-contributions. Thus, the U input contributes mainly to B and not so much to G; similarly the V input contributes mainly to R with some smaller contribution to G.
It should be noted that, in practice, the selected Encoding Color Space (i.e. the selection of RGB to YUV and YUV to RGB matrices) may or may not match Camera Color Primaries and/or Display Color Primaries. Standards define the matrix coefficients and signal levels in relative units, i.e. [0, 1] or [0%, 100%] for RGB and Y, [-0.5, +0.5] or [-50%, +50%] for UV. Digital signals are usually defined not in percents, but in 8, 10 or 12 bit levels. Also there are two types of digital signal ranges in use: Full & Narrow. BAF = BitDepth Adjustment Factor = pow(2, BitDepth – 8). The 1st column coefficients are 10 bit offsets, 2nd column coefficients are gain factors. These two sets of coefficients can be used for accurate calculation of digital YUV levels, e.g. Color Bars Test Pattern levels. They are suitable for any Dynamic Range format and for any Encoding Color Space. Tables and numerical examples of reference values, such as Color Bars Reference Levels for a variety of Color Spaces.